The problem with wealth creation is that unless you know where you want to reach, it does not matter how fast you run. Have you seen two people on a similar career path and making the same amount of money but ending up with starkly different wealth? Actually, you must see it all the time! There is a simple reason behind this. Skill and hard work alone is not enough to make you wealthy. You also need to make your money work hard for you. Here is how you go about it. A financial plan is a statement of your life goals with a clear financial implication and a plan to achieve them. The problem with wealth creation is that unless you know where you want to reach, it does not matter how fast you run. Set targets for your retirement, your children’s education, your equity portfolio, etc. Then work backward and see how much you need to save and where you need to invest. The best way to reach your goals is to tag your investments to specific objectives. Financial plans are flexible and can accommodate as many of your dreams as possible; make a bottom-up plan to achieve these goals and then streamline your investments as you go along. This is the Holy Grail to target. Nothing kills long-term wealth like high-cost debt. Take the case of credit cards and personal loans. The typical interest cost on a credit card is 35% per annum and a personal loan could cost you around 20%. If you are paying that kind of interest on loans, there is no way you will create wealth. The trick is to eliminate high-cost debt at the first opportunity. Repaying a credit card in full is like earning 35% on your investment and you can put these savings to better use. There are two facets to this argument. Firstly, how do you save? Treating savings as the residual amount after spending is not a smart way. First, work out how much you need to save and then work out your spending accordingly. Secondly, there is no bigger risk in the investment world than not taking a risk. If you allocate long-term money to a liquid fund paying 4% net of tax, it will take 18 years just to double. That is an awful waste of your risk capacity. You need to be in equities if you are looking at wealth creation in the long run. 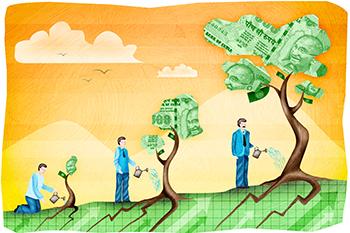 Adopt systematic investing or the SIP approach as we all know it. Firstly, it syncs with your income flows, so your investments work hard for you each month. Secondly, due to their very nature, SIPs give you the benefit of rupee cost averaging. Above all, SIPs are about financial discipline, which you get after investing on a regular and sustained basis. That is how money works harder for you. You may have the capacity to take risk or have a high-risk appetite but that is immaterial. Remember the golden rule that higher returns entail higher risk but higher risks do not automatically guarantee higher returns. The moral of the story is that you need to take calibrated risks if you want to make your money work really hard. For e.g., putting your money in a diversified equity fund for a 15-year period is calibrated risk. That is not the same as spinning the wheel at Las Vegas. Measure your risk before jumping into it. As Euclid rightly put it, “There is really no royal road to geometry”. Similarly, there is no royal road to wealth creation except making your money work hard and smart.